Public awareness of drones has risen dramatically. In the wake of the Gatwick and Heathrow drone incidents, the word “drone” has become synonymous with one big problem. The rather tricky question of how to police rogue Unmanned Aerial Vehicles. The question of what counter-drone technology is legal, affordable and effective. These UAVs are often so small and quick that they are quite literally off the radar. And, in the wrong hands or in the wrong locations, they can be disruptive, or even dangerous, to daily life. At DroneClash, this is the very problem we want to help solve. The competition which will take place in Katwijk, the Netherlands on 16th March 2019 aims to stimulate innovations in counter-drone technology to help make the world a safer place. A place which will enjoy the many potential benefits of drones, without having to worry about them, for example, colliding with a plane. potential to offer huge benefits to society. More efficient logistics, rapid emergency health care in remote regions and better environmental surveillance, to name just a few of the emerging possibilities. Not to mention, the kick that lots of people get from flying – or even racing – drones. Let me lay our cards on the table, the organisers of DroneClash are drone lovers. The team is made up mainly of researchers from the Delft University of Technology’s Micro Aerial Vehicle Laboratory. And in truth, there is nothing Bart Remes and his team enjoy more than designing and building new types of drones and then getting them to take flight. Beyond that, we also love checking out other drone lovers’ drones. Comparing specs. Drone to drone. Drones have become far more accessible in recent years with off-the shelf drones costing hundreds rather than thousands of Euros. But for the most committed drone developers, such easy-access has taken away the creative challenge of drone design. It was the engineering that made it so much fun in the first place. For these people, DroneClash will stretch them in a whole manner of new ways. Beyond the usual task of designing and making a mini-machine that flies, they will also have to engineer their drones to dodge and defend against repeated attacks. 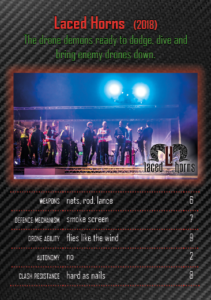 Not to mention the ultimate challenge of felling the opposing team’s Queen Drone. How they do it, that is up to them. Jamming is not permitted, but anything else goes. Nets, lasers, fire water cannons and confetti were all put to use in DroneClash 2018. Our game of drones: Top Bumps! As we know by now, drones in flight are not so easy to spot. In fact they are usually easier to hear, rather than see. So how best to showcase the technical wizardry of DroneClash designs? 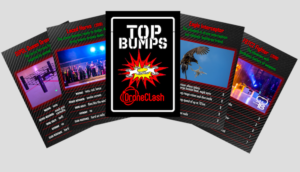 Remembering the fun card games we played as children, we decided to create our very own DroneClash card game: Top Bumps. 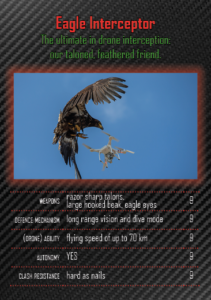 For now, it’s a fun way of showing off the stars of the show: novel counter-drone tech. But over the coming weeks, as we add in this year’s hopefuls, we aim to get a full deck of cards. Ultimately we want to answer the €50,000 question: who will be this year’s Top Bump? The FBTC2 team fully embraced the spectacle that is DroneClash. They came along determined to stage a counter-drone carnival. They deliberately designed their fighter drones to be big. And by big we mean one cubic metre. The serious stature served a dual purpose: it made the drones wonderfully visible and also meant they could transport a bombastic battery of weapons. FBTC2 packed their drones full of everything they could think of. Confetti cannons, flamethrowers, paintball guns, you name it. Despite the showmanship, the FBTC2 Team kept their most important weapon top secret. That was until he reaped absolute havoc. Working from behind the scenes, the stealth-like figure of a hacker succeeded in taking over the control signals of rival drones, causing rampant disruption in the arena. FBTC2’s sophisticated hacking was an amazing feat and even more so because this offers potential as a legal way to both detect and counter nefarious drones. In honour of their efforts, the jury awarded the FBTC2 team Innovation Award. 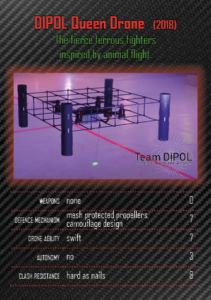 DIPOL were DroneClash 2018’s cage fighters, albeit fighters working from the principle of minimal aggression. Agility, speed and robustness meant that they were able to grab a respectable second place in the competition without resorting to more violent tactics such as throwing flames. 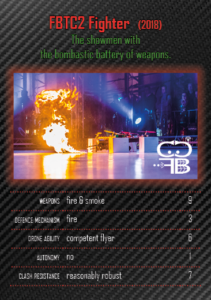 They wowed the audience with their drones’ carbon outer-skeletons which made them extra robust in aerial combat. Indeed, this German counter-drone team boasted excellent piloting skills. This was further enhanced by the the fact that they had developed a trick to switch between drones, without interfering with other video signals. 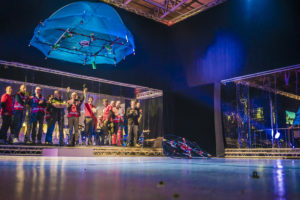 This team, made up of researchers from the University of Twente’s Robotics and Mechatronics lab and Clear Flight Solutions (the company known for its ornithopter “Robird”) combined contemporary research, piloting skills, prototyping facilities and practical knowledge. This proved to be a winning counter-drone combination. After multiple convincing victories and ultimately, these drone-developing demons were crowned DroneClash Champions of 2018. The first battle was the Laced Horns versus DeceptiDrones. Gadgets versus skills, flashy colours vs stealth. Ready, steady, go! The fighters from the Laced Horns were fast. Very fast. Without a moment’s hesitation they left the DeceptiDrone fighters for dust, navigated the Hallway of Doom, Destruction and Death and before anyone had time to realise it, the Laced Horns shot through to the Queen Arena. They hit the DeceptiDrone Queen hard. It did not stand a chance. In less than 30 seconds, it was game over with a clear win for the Laced Horns. This set of events would turn out to be a recurring theme for the Laced Horns. “Skills and speed, just as we thought it would”, shouted an ecstatic Geert Fokkema team captain of the Laced Horns. Entries close on January 31st 2019. 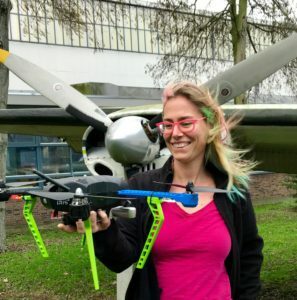 Next up on the Flyin’ Amber blog, we’re going to be talking about why nature is a source of inspiration for drone and counter-drone technology.